The entire Push series by Lark Publications is designed to explore the outer limits of each discipline it covers. Already there are Push volumes covering Paper, Stitch, and Print, and you can find reviews for these books posted on Mixed Media Artist. These are not project books, and they are not even coffee table books filled with work that you will love. 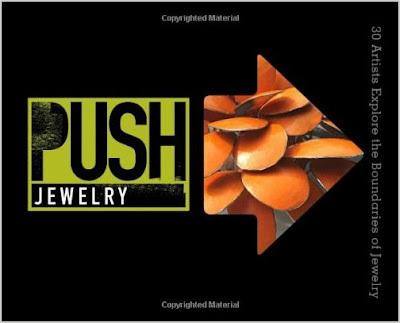 In fact, I didn't love any of the work in Push Jewelry. There were pieces that I liked, pieces that provoked me to think, pieces that challenged my sense of what jewelry is. Even though the work is wonderfully photographed, and the books are beautifully presented, these are far from being typical eye-candy books. Some of the work may even gross you out...but it WILL get you thinking, guaranteed. I recommend this book, but with several reservations and a big caveat. The reservations: Do not expect to learn how they do what they do. Do expect to enter the process and the mind of the artist, and that's not always a comfortable place to be. The caveat: Do not buy this book unless you are truly interested in the boundaries, the edges, the broken taboos, the challenging, the offensive. You can be interested in this work and fascinated by it without wanting to make it! Thanx for the chance to win this book. Cyndi I tweeted about your book give away. thanks for offering up this free book. I would love to win it so kindly include me in the running. Your work is beautiful and unique. I would be so luck to win a copy of your work!! Keep up the beautiful creating, I look forward to seeing more of your designs! !